Ready for Something Really Different? 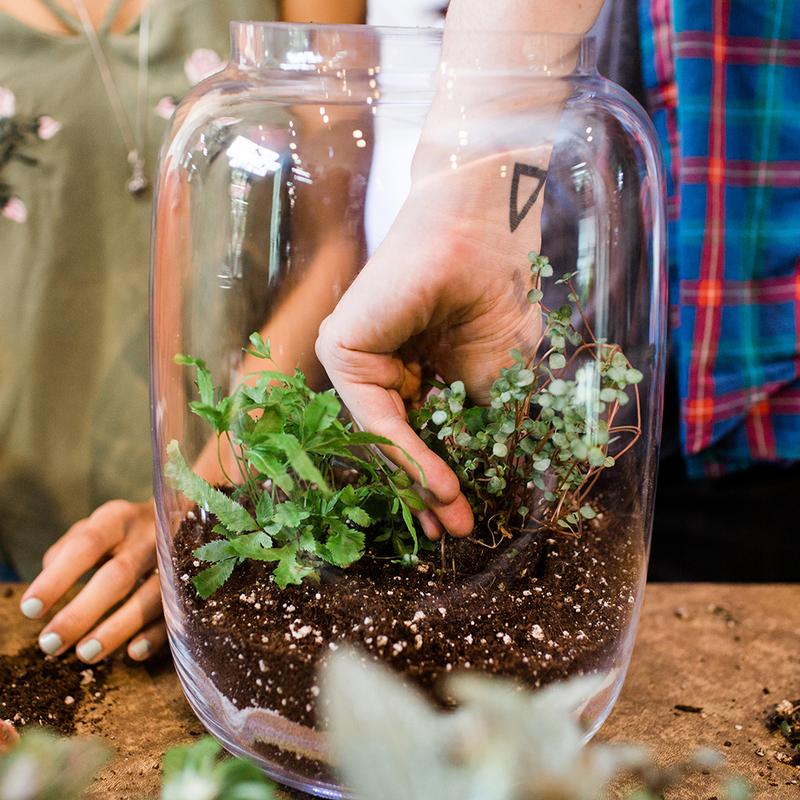 Our terrarium class is a one-of-a-kind experience. You’ll not only get to express your creativity using tropical plants, live mosses, and beautiful rocks & minerals; you’ll learn the history, science, design and maintenance of a truly self-contained ecosystem. You’ll also get your hands into the real stuff of life, getting in touch with nature and then taking home something beautiful. No wonder our terrarium class is the most popular class of its kind in the United States! Just pick the date and time that works for you. There are six different times to chooser from each week. Make the class a fun, romantic date or take advantage of our Group Rate by bringing a group of 4 or more friends—life is better together! We provide all the materials you could ever want—soils, plants and containers. You’ll arrive with a $25 credit toward whatever you choose to plant, so come prepared to plant something truly extraordinary. You’ll take home a self-contained, closed ecosystem terrarium that will live with you for years and years to come—all covered by our no-fault warranty and maintenance. In order to be covered by our No-Fault Warranty, all terrarium materials must be clean and healthy as provided by us. That means you may not bring your own terrarium containers or plants to our class. If you like, you may plant more than one terrarium during a class for yourself and/or as gifts for others. You will be charged only for whatever purchases you choose to make over and above your $25 credit. Credits may not be combined. Everyone gets to plant their own terrarium. People 21 and over are welcome to bring along their own grown-up beverages to enjoy during the class (wine, beer or cider only, please.) Bottled water and gourmet soft drinks will be provided by us, free of charge.